The products of the reassembly reaction of tetradecameric two-ring quaternary structure of GroEL chaperonin under the pressure of its heptameric co-chaperonin GroES have been visualized by electron microscopy. It has been shown that one-ring heptameric oligomers of GroEL have been formed at the beginning (after ~5 min) of the reaction, while at the final stage of the reaction (after ~70 min), both onering heptamers in complex with one GroES and two-rings tetradecamers in complexes with one (asymmetrical complex) or two (symmetrical complex) GroES heptamers are present. The relationship between the data of light scattering, native electrophoresis, and electron microscopy obtained earlier has been discussed. Original Russian Text © N.A. Ryabova, O.M. Selivanova, G.V. 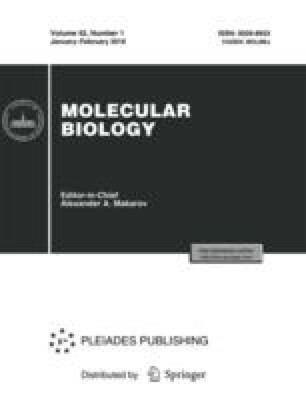 Semisotnov, 2018, published in Molekulyarnaya Biologiya, 2018, Vol. 52, No. 1, pp. 120–124.